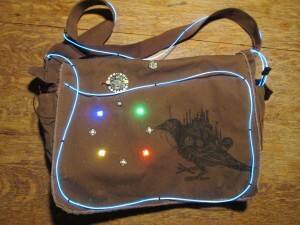 After seeing Limor Fried’s Tron messenger bag, I too wanted to put some EL wire onto my new bag. Although mine isn’t quite as nicely designed as Limor’s, I’m still happy with it. The thing that I really wanted to put on the bag was a compass. Why you may ask? Every time I visit a new city, I usually rely on Google maps on my phone to find my way around. My phone however, does not have a compass so I sometimes have a tough time finding out which way down the street I should go. In a mid-sized town, this usually isn’t a problem but when you’re in say, downtown Vancouver, you can get pretty confused easily. Confused? Why not look at some pretty lights? 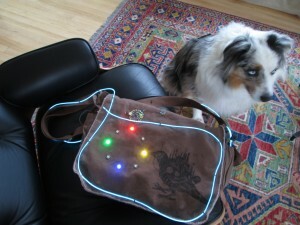 For the compass rose, I stitched the Adafruit neopixels together and hooked them up to the Adafruit Flora. 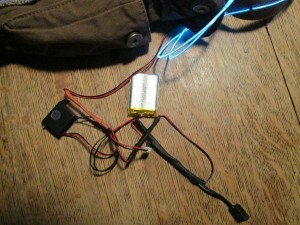 Also connected to the Flora is a magnetometer/accelerometer. The magnetometer probably gave me the most grief. 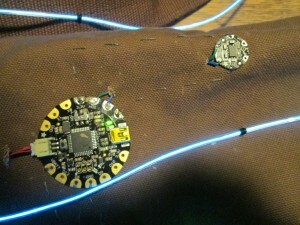 It turns out that if you want to use communications protocols (like I2C) on e-textiles, make sure the connection is SOLID! I became so frustrated with the magnetometer not talking to the Flora that I just soldered some wires instead. Despite the frustrations, I’m pretty happy with how the bag turned out. This was also the first time using the Flora and I have to say, I love it! I can certainly tell that the folks at Adafruit put A LOT of thought into it. One little detail that made me really happy was strategically placing the SDA, SCL, power and ground pads so that you wouldn’t have to have any thread/wires cross. If you’ve been working with e-textiles for a while, you’ll know exactly what I mean! Seriously, Adafruit…thank you!!! Currently, there is no tilt compensation for the compass and I will be adding that later. I might also add another mode that measures acceleration and displays it on the circle of LEDs. 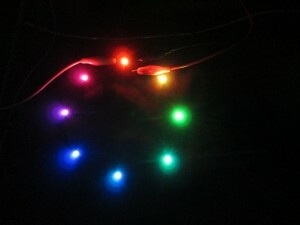 Dogs love EL Wire too!